Two channels of heavy-metal thunder for the studio or practice. 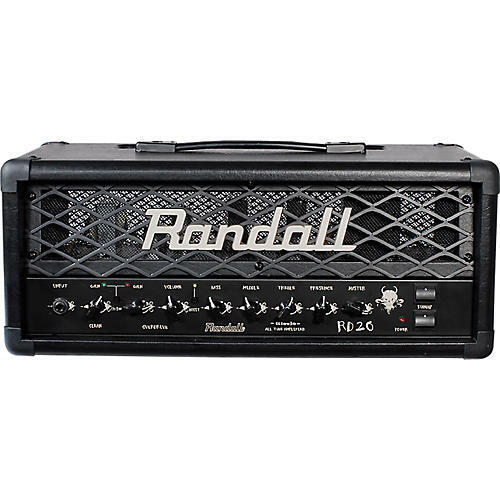 The Randall RD20H 20W amp head provides all the spine-crushing tube-driven tone of its bigger brothers, but in a size you can use at home. It features two footswitchable channels (Clean and Overdrive) with a volume boost, and shared four-band EQ and master volume. Each channel has independent gain controls, and the Overdrive channel has an independent Volume control.Around the back of the ruggedly constructed head are dual speaker outputs, speaker-emulated XLR output for direct recording or feeding directly to a house PA, an FX loop and the tone complement of two 6L6 power tubes and four 12AX7 preamp tubes. Dimensions: 19.7" x 9.5" x 8.5"